Abstract: This case demonstrates the use of a novel design of lower removable appliance to correct an anterior crossbite, by retracting the lower incisors. Clinical relevance: Patients usually do not tolerate lower removable appliances; however, this case highlights how a simple modification to a lower removable appliance can make it patient friendly and a useful appliance in the management of anterior crossbites in those cases where an upper appliance is not appropriate. Author notes: Felicity Borrie, BDS, PhD, MFDS, MOrth, FDS(Orth) RCS(Ed), Consultant Orthodontist, Dr Gray’s Hospital, Elgin and David Bearn, BDS, MSc, PhD, F(Orth)DS RCS, MOrth RCS, FHEA, Professor of Orthodontics, University of Dundee Dental School, Park Place, Dundee DD1 4HR, UK. 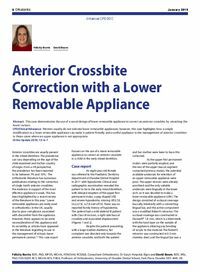 Objective: To highlight how a simple modification to a lower removable appliance can make it useful in the management of anterior crossbites where an upper appliance is not appropriate.